Today's leaders are expected to reduce costs, increase productivity, drive innovation and help the business identify and pursue new business opportunities. Successful IT leaders will be the ones that become strategic business partners and decision influencers in their organizations. Unleashing the Power of IT describes in actionable detail, the new mindset, core skill set, and interpersonal tool set that are necessary for IT leaders to thrive in today's increasingly complex challenging business environment. A special feature of this book includes a chapter profiling several world-class organizations that have implemented the principles in this book. Learn about the culture change challenges they overcame and benefit from their best practices and successes. Dan Roberts is President and CEO of Ouellette & Associates Consulting, Inc., the IT leadership and professional development company known globally for developing the "human side" of the IT equation. 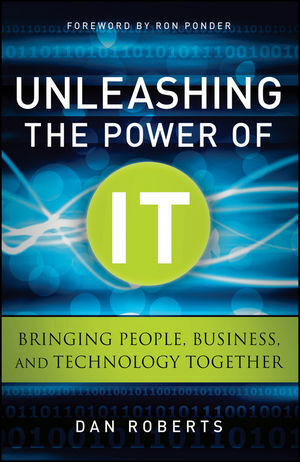 Drawing on more than twenty-five years of industry experience, and based on their work helping more than 3,000 IT organizations transform their workforces and cultures, Roberts and his team share a road map for succeeding in today's increasingly complex, ever-changing business environment. Roberts has contributed to several books and published numerous articles in leading industry journals on topics relating to IT transformation and preparing IT for the future. To learn more, visit www.ouellette-online.com. OUELLETTE & ASSOCIATES CONSULTING, INC., has worked with more than 3,000 IT and shared service organizations since its founding in 1984 and is the leading provider of IT professional development and project management training, focusing on the "human side of technology." Unleashing the Power of IT: Bringing People, Business, and Technology Together has been years in the making and is based on this extensive real-world experience.